After a solid first round in the Brackets for Good Tournament, Golden Retriever Rescue and Community Education was victorious in Round 2, defeating the Indy Police Foundation 6534 to 3317. During the two rounds, CIPF raised over $5,000. Thanks to all who supported our effort! With one year under our belt, we’ll look forward to participating next year. Can we count on your support? Please Donate and Assist Fishers Officer Binh Dennis! 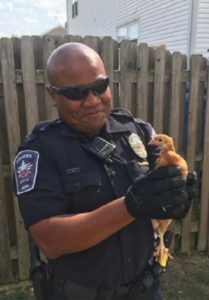 Please donate and assist Fishers Officer Binh Dennis by clicking here!